The Lancashire and Cheshire Antiquarian Society was founded in 1883 to promote the study of the history of Lancashire and Cheshire. Its sphere includes archaeology (both traditional and industrial), economic and social history, architecture and the arts, and folklore. Its range extends from antiquity to the more recent past. 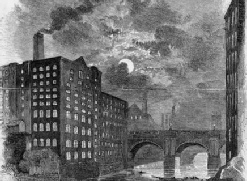 Although the Society is based on Manchester, its studies and activities embrace the region. Membership is open to all individuals and societies who are interested in the various historical aspects of the two (pre-1974 reorganisation) Counties Palatine. The Society aims to make relevant new research available through its Transactions. Each volume consists of a selection of peer-reviewed articles of scholarly and popular interest on all aspects of the history of our two counties, along with book reviews, and reports of the Society’s activities. The Society aims to hold annual day schools, either self-promoted or occasionally in association with other organisations. Recent topics have included ‘Manchester in the Age of Mrs Gaskell’, and ‘Living under the law in the Medieval North West’. Additionally, visits to places of historical, architectural and archaeological interest may be arranged. Housed in Manchester Central Library, the Society has an extensive library relating to the history and antiquities of both counties, containing some unique items. Arrangements to view the library are being reviewed. The Society makes representations concerning listed buildings, conservation areas and major planning applications to the appropriate authorities. It is also represented on the Manchester Conservation Areas and Historic Buildings Panel and other local and regional organisations.